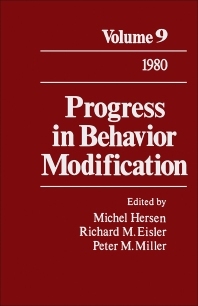 Progress in Behavior Modification, Volume 9 covers the developments in the study of behavior modification. The book discusses the future of behavior therapy; an examination of the rationale and treatment effectiveness of overcorrection; and the therapeutic innovations and emerging conceptual challenges in the behavioral treatment of test anxiety. The text also describes the conceptual and empirical status of rational-emotive therapy; the behavior modification procedures for training chronically institutionalized schizophrenics; and the behavior modification of the elderly. The behavioral assessment and training of children's social skills are also considered. Psychologists, psychiatrists, and educators will find the book invaluable. Michel Hersen (Ph.D. State University of New York at Buffalo, 1966) is Professor and Dean, School of Professional Psychology, Pacific University, Forest Grove, Oregon. He is Past President of the Association for Advancement of Behavior Therapy. He has written 4 books, co-authored and co-edited 126 books, including the Handbook of Prescriptive Treatments for Adults and Single Case Experimental Designs. He has also published more than 220 scientific journal articles and is co-editor of several psychological journals, including Behavior Modification, Clinical Psychology Review, Journal of Anxiety Disorders, Journal of Family Violence, Journal of Developmental and Physical Disabilities, Journal of Clinical Geropsychology, and Aggression and Violent Behavior: A Review Journal. With Alan S. Bellack, he is co-editor of the recently published 11 volume work entitled Comprehensive Clinical Psychology. Dr. Hersen has been the recipient of numerous grants from the National Institute of Mental Health, the Department of Education, the National Institute of Disabilities and Rehabilitation Research, and the March of Dimes Birth Defects Foundation. He is a Diplomate of the American Board of Professional Psychology, Distinguished Practitioner and Member of the National Academy of Practice in Psychology, and recipient of the Distinguished Career Achievement Award in 1996 from the American Board of Medical Psychotherapists and Psychodiagnosticians. Dr. Hersen has written and edited numerous articles, chapters and books on clinical assessment. Pacific University, Forest Grove, Oregon, U.S.A.